Review by AllTheBestFights.com: 2019-01-26, great performance by both boxers: Keith Thurman vs Josesito Lopez is close to get four stars! The undefeated current Wba and former Wbc Ww champion Keith Thurman entered this fight with a perfect boxing record of 28-0-0 (22 KOs=76%) but he is not ranked as he hasn’t fought since March 4, 2017 when he defeated Danny Garcia (via split decision, Keith Thurman vs Danny Garcia); before this bout, in 2016, he had beat Shawn Porter (Thurman vs Porter). His opponent, Josesito Lopez, has a record of 36-7-0 (19 knockouts) and he entered as the No.42 welterweight in the world. He lost to Andre Berto in 2015 (Andre Berto vs Josesito Lopez) but then he has won over Todd Manuel, Saul Corral and Miguel Cruz (Josesito Lopez vs Miguel Cruz). 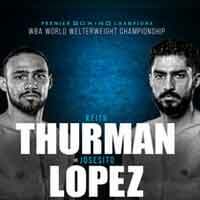 Thurman vs Lopez is valid for the WBA Super World welterweight title. Watch the video and rate this fight!